Mies van der Rohe peut reposer en paix: tout indique que l’ancienne station-service Esso de L’Île-des-Soeurs va rester debout. 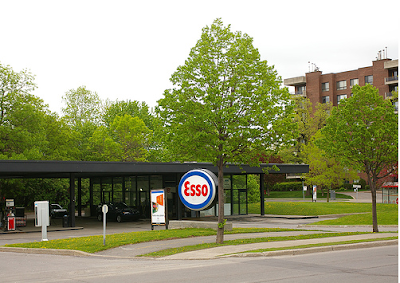 Mies van der Rohe can rest in peace: everything indicates that the old Esso Gas Station on Nuns’ Island will remain standing. The local council in Verdun, where the station is located recently unveiled a project called the «Maison des générations», “House of Generations” which will give a new use to this important piece of modern architecture in Montreal. It’s been closed and boarded-up since December. A poll last year revealed that 73% of the residents of L’Île-des-Soeurs, Nuns’ Island, agree with this idea, said the Mayor of the area. The plan is to integrate a Youth Center with a Center of Activities for the Elderly. And to preserve the décor unique of the station-service. 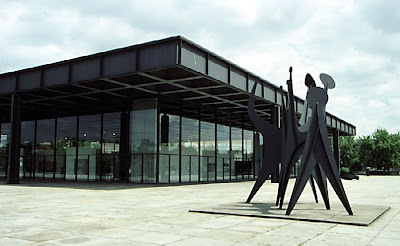 The Director of the Restoration, Dany Tremblay,assures that the project will respect the historic character of the building, which will once again display its glass wall as Mies imagined in the original plans. Right now, zoning laws only permit uses for the building tied to automobiles. The new project will demand a change in the zoning, this will be put to the people with a referendum. 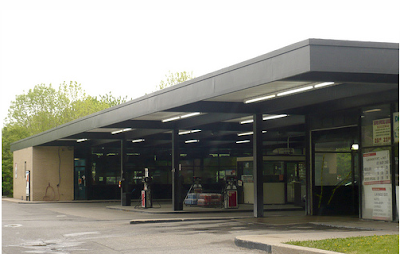 The City of Montreal is also studying the possibility of listing the gas station as a monument historique. It is expected to pass. The listing would not only make it esier to protect the building, but would also guarantee funds for future restoration projects. O Canada! You make everything so easy. 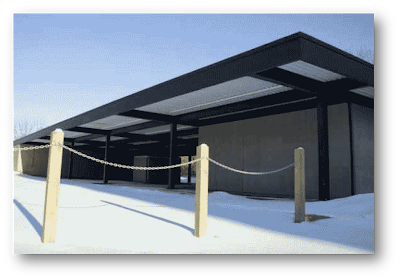 See this story in the Toronto Globe and Mail about the shuttering of the gas station on Nuns’ Island in Quebec, Canada designed by the office of Mies van der Rohe ? 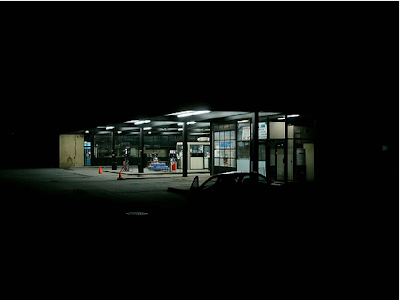 The Mies gas station is no more. 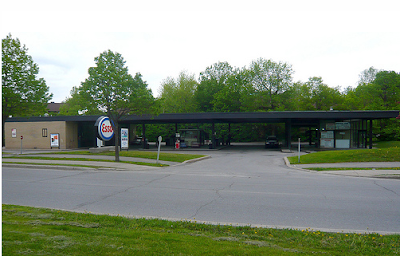 In December, Esso quietly removed the pumps and put plywood over the glass and the company sign out front. Now, Montreal’s Verdun borough is left to sort out what to do with a rare piece of architecture not easily adaptable. “The thing really is beautiful; it’s so unassuming, like a lot of great artworks,” said Phyllis Lambert, whose family, the Bronfmans, commissioned the Seagram Building. 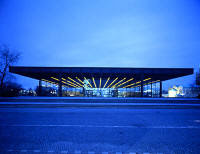 “It’s of a great simplicity, and it’s a building that was really thought out. 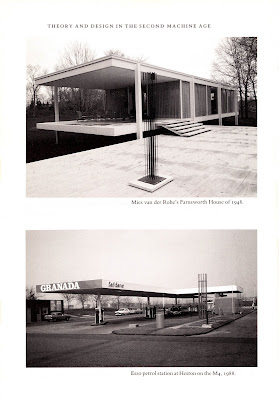 It’s not overstated, it’s very modest, very functional, and very well designed,” said Dinu Bumbaru, the director of Heritage Montreal, who has described it as the “Ritz” of gas stations. Ms. Lambert and Mr. Bumbaru are monitoring proposals for the site, owned by island developer Proment Corp. The filling station was a departure from the garish corporate colours, neon signs and blinding flood lighting of most modern service stations. Baudrillard says advertising is signs and codes which appear to represent social reality, but actually constitute their own realm– of hyper-reality– which has little to do with what is real. When we’re exposed to it enough, hyper-reality and media-reality can seem more real than the real. And so, after these brightly-lit modernist gas stations popped up all over, artist Jenny Holzer added LED words, signage, like advertising, on the ceiling of Mies’ New National Gallery in Berlin. I love her piece. It says a lot. But I’m glad it’s off most of the time. You are currently browsing the archives for the Nuns’ Island category.